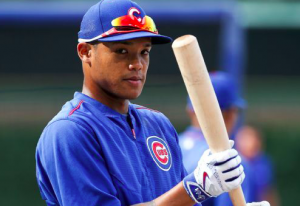 Major League Baseball has placed Chicago Cubs shortstop Addison Russell on administrative leave. The move was made Friday in response to allegations of abuse from Russell’s wife, Melisa Reidy-Russell. Earlier this week, Reidy-Russell published a blog called “You no longer have a secret, you have a story” that was linked to her Instagram page in which makes the accusations. Without going into too much detail, Reidy-Russell recalls several occasions in which Russell was physical or aggressive toward her. She adds that verbal and emotional abuse became an almost daily occurrence in their relationship. The couple officially divorced last month. “Being blamed for just about anything that went wrong, name calling, intimidating me with personal force, manipulating me to think I was the problem, destroying my personal things, threatening me to ‘send’ me & our son home to my parents as if I was privileged to be living in our home,” Reidy-Russell wrote in the blog entry. This is not the first time Russell has been accused of domestic abuse. Last June, Reidy-Russell made similar accusations in an Instagram post. The post itself claimed that Russell had been unfaithful and that their relationship was close to ending. A friend then added a comment on the post alleging physical abuse before the post was deleted. At that time, Russell denied that the allegations were true but was not placed on administrative leave. “We questioned him on it and he reaffirmed his stance that he did not do what he is accused of having done,” said Cubs president of baseball operations Theo Epstein. When those accusations were made last summer, MLB opened an investigation into Russell that remains open to this day. However, Reidy-Russell was not a willing participant in that investigation. Now that she published an account of the alleged abuse on her own, MLB may be able to complete the investigation into Russell. Until MLB completes the investigation, Russell is likely to remain on administrative leave. It’s impossible to know when the investigation will be finished. With a little over a week left in the regular season, it seems unlikely that Russell will be taken off administrative leave before the end of the season. MLB will then be able to levy punishment against Russell regardless of any criminal charges being filed against him. Russell has been Chicago’s primary shortstop for much of the season. However, he’s had a somewhat disappointing season offensively. Russell has started to fall out of favor in recent weeks following a brief stint on the DL with a sprained finger. Javier Baez has started to see more time at shortstop with Daniel Murphy and Ben Zobrist both viable options at second base. This should make it easier for the Cubs to finish the regular season and enter the playoffs without Russell. Meanwhile, Russell’s future in baseball and with the Cubs is uncertain. If MLB can substantiate the blog post from Reidy-Russell, Russell is likely to face a lengthy suspension. Whether he’s welcomed back to the Cubs or any other team remains to be seen and should not be seen as a guarantee.